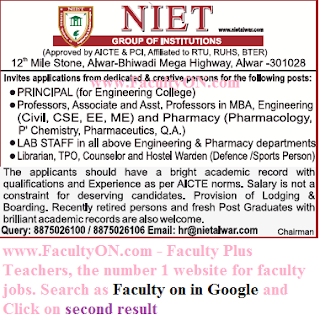 NIET Group of Institutions, Alwar has advertised in THE TIMES OF INDIA newspaper for recruitment of Professors / Associate Professor / Assistant Professor / Principal Plus Non-Faculty jobs vacancies. Interested and eligible job aspirants are requested to apply immediately from 04th April 2018. Check out further more details below. 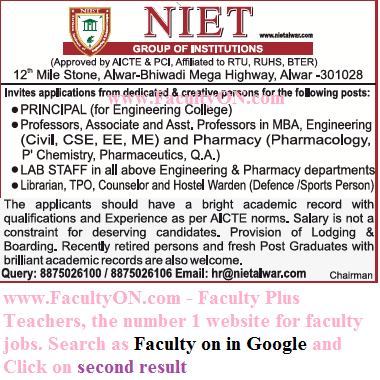 About College: Northern Group of Institutions, Alwar (NCR) providing quality education in the fields of Engineering, Business Management and Pharmacy was established in 2005. The Institutions having intensive academic environment with the mission to prepare students with capacities and creativity to have new thoughts, new horizons and analytical capabilities so as to enable them to achieve the objectives of business and society.